The Marshall News Messenger article posted June 25, 2017, read, “The Rotary Club of Marshall made history Thursday, installing its first black female President – Harrison County’s family and consumer sciences extension agent, Louraiseal McDonald. This flash back into the past requires that the stage be set. World War II had ended May 8th, 1945, but the war in Japan was still raging. One-hundred years ago today, history was made when the application for membership in the International Association of Rotary Clubs, was signed and submitted by the officers of the newest Rotary Club in the world, which would receive it's official charter August 1, 1919. Bobby Rosborough was an interesting person in his own right, charming, charismatic, somewhat flashy and debonair. He was the son of J. C. Rosborough, a prominent doctor, so it was not unexpected that he became a Rotarian, having started a thriving insurance business in 1926, fresh out of A & M. He served as District Governor Frank Davis’s Conference Secretary in 1932 and later served as the club secretary for four years after that. One of the most interesting things that the research of the past year and a half is the amount of time, money and effort that has been expended by Rotarians in the past one hundred years to build and support the schools in Harrison County. We are indebted to the Marshall News Messenger and its predecessors for most of the verification of this fact. 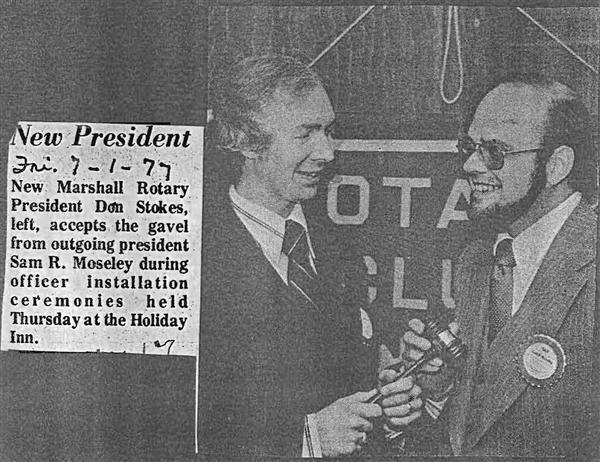 The announcement of the forming of a new Rotary Club in Marshall was published in the February 13th, 1981 edition of the Marshall News Messenger, announcing the forming of the Rotary Club of Marshall Metro. It was Paul and Silvester who met for dinner on Thursday evening, the 23rd of February 1905. Frank Davis was president of the Marshall Rotary club in 1922, and no doubt instrumental in having a pictorial disclosure of the members of the young club published in the newspaper, February 23, 1922, on pages 33, 34, 35, and 36, but the responses of the members suggest that it was not a popular idea, yet, everyone seemed to treat it with a good deal of levity and some respect. Six years before the Rotary Club of Marshall was organized, congress had created one of the most contentious pieces of legislation in the history of the United States, the income tax. In 1913, the Sixteenth Amendment to the United States Constitution made the income tax a permanent fixture in the U.S. tax system. The Marshall Rotary club wanted the first president of the club, Ike Hochwald, to be the first district governor from the club, in 1921, but Ike felt that he was not able or experienced enough to accept the position and withdrew, and threw his support to another candidate from San Antonio. Some TV evangelists thrived and prospered for decades by urging their flocks to “give till it hurts”, others suggest “give, and it will be given to you”. Now, the internet is rife with charities, appealing to our sensibilities and our checkbooks. One of the most time-demanding jobs in a Rotary club is that of club secretary, which, for the most part, occurs behind the scenes, and alone, carefully inscribing the events of a meeting or project in the record books. Homer Price was a newspaper man first and foremost. He began his newspaper career as an apprentice printer in Marysville, Tennessee. He moved to Marshal and bought the Marshall Messenger in 1877 for $500 and sold it a few months later to W. A. Adair, after a brief and very stressful period of newspaper ownership. An article in the Marshall News Messenger, dated June 3rd, 1981, describes the experience of the first Rotary Group Study Exchange program in Rotary District 5830, in East Texas, when a group of six men from District 136 in Iceland were hosted by the Rotary Club of Marshall for a few days in March of 1980.
Who knew that Rotarians had talent? Apparently, they thought they did May 10, 1949, because someone slipped into one of the Thursday-noon meetings, took notes, and turned them in to the Marshall News Messenger, which blabbed it all, over town. From Argentina to Marshall, via San Antonio, a novel idea takes the nation by storm. Hardy Adams of Marshall, who started the "APAP" club here and signed up 200 members in four hours, said the story of the club was told him by a friend from Argentina whom he saw recently in San Antonio. One of the things the early Rotary Club of Marshall did was involve the wives, daughters, and sweethearts in the Rotary experience by holding some of their regular meetings at night so the ladies could attend, and holding other special meetings such as Father-And-Son, and Ladies-Night banquets at night also. William Howard Taft was born in Cincinnati, Ohio, September 15, 1857. He was a graduate of Yale and the Cincinnati Law School. His political career began when he was made Assistant Prosecuting Attorney for Hamilton County in 1881. One of the lesser known elements of Rotary International is the Rotary Interact club, sponsored by local Rotary clubs around the world. In the early years of Rotary, there was no email or internet, and telephone service was expensive and spotty. When Rotary was in its infancy, clubs depended on face to face communication at regular weekly meetings to pass on and receive instructions, carry on business, and announce upcoming events. Though this article appeared one hundred years ago, in February of 1919, five months before the Marshall Rotary Club was organized, it serves as a reminder, that the question, “Is it Fair to all concerned?”, the second question in the Rotary Four-Way Test, is still valid and applies, today. I would like to share an article from the "Marshall Morning News", December 25, 1921, written by the then-president of the Marshall Rotary Club, Frank Davis. Frank was to become the District Governor in 1931-32 of District 48, which included the Eastern half of the entire state of Texas at the time, and eventually became District 5830, which now includes the Northwestern part of Texas, several Counties in Southeastern Oklahoma, and Miller County in Arkansas. Joe Hirsch, Manager, Joe Weisman & Co, 511-517 N. Washington Ave., was one of the charter members and one of the first officers of the Marshall Rotary Club. The Rotary Club of Marshall will be celebrating its 100th birthday August 24, 2019 at the convention Center, honoring the men and women who have faithfully led the club during a century of “Service Above Self”. Many interesting things have been revealed in our search of the archived records of the “Marshall News Messenger”, but one of the more interesting ones popped up at a banquet March 31, 1955, which was held here in Marshall, to celebrate the golden anniversary of Rotary International. As a new Rotarian, I marveled at the dedication and unselfishness of Rotarians worldwide and wondered why there were no buildings bearing the name and logo of Rotary, and no monuments to the great causes and achievements of the men who served so proudly and well. Later I also learned about the stipulations in the Rules and Guidelines of the Rotary Foundation, the funding arm of Rorary, which prohibit the use of Foundation funds for building of any new buildings, including hospitals, meeting halls, and such, and clubs and districts , for the most part followed those stipulations as well. For many years following Marshall Rotary's initiation of the Scholarship Fund to provide scholarships for college-bound students, it was the practice of the club to accept a $1 per year donation to the Scholarship Fund from each member. This dollar was collected in the member's birthday month. The Centennial-Armistice-Day ceremonies this week, soberly remembered those Veterans who died in the trenches of France and Belgium. "When the Armistice was signed on November 11, 1918, the fighting was over", became one of the most famous fallacies of all time. Perhaps they should have included “Boy Scouts” who died fighting the German Army well after the Armistice was signed. During the 1920s immorality and crime ran rife and efforts to curb both were mostly unsuccessful (think “Prohibition” and “Chicago Mob”). The Knot-Hole Gang was a notable exception. For the most part someone does not join Rotary looking for fame or recognition and the Marshall Rotary club does not encourage or sponsor self-promotion schemes in any way. Supercalifragilisticexpialidocious may be a long and made-up word, but it is easy to pronounce if you have heard it sung by a very talented artist. Kids all over the world squealed and adults like me, couldn't get the catchy tune out of their heads after they heard Julie Andrews sing it in the movie “Mary Poppins”. In a speech, recorded in the "Marshall News Messenger", dated June 12, 1947, Mrs. J. F. Lentz, recalled the beginning of The Marshall era. Few aspects of the research into the history of the Rotary Club of Marshall Texas, have been as interesting and inspiring as the story of its founder’s life, which David Weaver captured brilliantly in the first paragraph of his tribute in the Marshall News Messenger, March 7, 1999, page 42. Sometimes one joins an organization for one reason but leaves a legacy of a completely different sort. Such was the case for Jim Kennedy who moved to Marshall and joined the Rotary Club in 1922 for business reasons. Rotarians in the first part of the 20th century, for the most part, were just grown-up kids in suits and hats. Scouting was as much a part of their lives as newspapers and cigars. .... “never, in the field of human conflict was so much owed by so many to so few”, is considered to be one of the most memorable speeches delivered by Prime Minister Winston Churchill during WW II. It was one in which he praised the gallant pilots who flew the Spitfires and Hurricanes against the Luftwaffe during the battle of Briton when the odds were unbelievably high. Whether battling the Ku Klux Klan, The Lions, or any one of the thousands of battles that Rotary has engaged in over the past 100 years, one thing is certain, not all battles are winnable, at least in the short term, but defeat is not an option; the battle against disease falls into that category. Only one battle in this category has ever been won in my lifetime, the battle against smallpox. The devastating disease killed one out of every three who got it. According to Wikipedia, smallpox was the leading cause of death in the 18th century, killing over 400,000 people. Rotary International President, Ed Cadman described a typical Rotarian as: “an ordinary man, doing extraordinary things in quite ways.” There is no better example of that statement than Marshall Rotarian, Lt. Col. Tommy Athanas, who passed away September 24, 2001. Rotary clubs are non-government-organizations (NGOs), and as such are not allowed to take sides on political issues. Individual Rotarians, however. are free to choose whatever candidates or parties seem appropriate to them, and support the laws enacted by them. but, politically biased programs or campaigning for office are not permitted at club meetings. For ninety-nine years, three weeks and one day we have been standing on the shoulders of giants. Soon we will join them celebrating a century of changing lives in Marshall and beyond. The Hotel Marshall hosted the weekly meetings of the Maershall Rotary club for over 40 years. The Hotel Marshall was host for most of the social events in Marshall during the first half of the twentieth century. It played a vital role in the progress and growth of the Rotary Club of Marshall Texas when it was chartered August 1, 1919, until the club moved in 1966. June 15, 1920, Dr. Humphreys, president of the College of Marshall, offered the Marshall Rotary club a scholarship, which they could award to a high-school graduate that the Marshall Rotary club thought would otherwise be unable to attend school (college) and who would benefit from the grant of $80 to pay a year’s tuition. The Rotary club scholarship program, using funds transferred from the Student Loan Fund in 1946 and in 1948, awarded its first scholarship in 1949 to Miss Olga Miller. A Century of Serving Our Youth began within weeks of it's admittance into Rotary, when Rotarians of Marshall decided that defending and helping children, essentially changing and reshaping their future, was to be one of their top priorities from the very beginning and has continued as a major part of the Marshall Rotary club’s service projects in one form or the other since then. When the Marshall Rotary club, was established, in 1919, no one thought it would play a prominent role in the shaping of a new avenue of service in Rotary, so, when it introduced a novel new element (Youth Services) into what had heretofore been a dignified and austere organization, it attracted little attention. Though he had traveled the world for five years, Paul Harris had never heard of Marshall Texas when he started his first Rotary club in Chicago with four of his business associates, on a “you scratch my back, I’ll scratch yours” basis. The early motto, “He Profits Most Who Serves Best”, reflected the mission statement of Rotary, wherein business (Club Service) was paramount, community needs (Community Service), was second, and Vocational Service was a catchall for all other services. By 1919, Paul Harris had patiently and skillfully crafted his vision of Rotary into a rapidly expanding, well organized, and effective organization, whose purpose was to coordinate and support over 500 clubs in six countries. During those fourteen years much had been happening behind the scenes; the new organization had chosen a name (Rotary), a motto (“He Profits Most Who Serves the Best”), a logo (a spoked-wheel), had adopted “Ideals”, had established a constitution and bylaws, had begun to hold conventions, and, having a lawyer at the helm, had begun to establish rules and guidelines for clubs to follow. Paul Harris, a twenty-eight-year-old practicing attorney, set up his law practice in Chicago. Nine years later, Paul, then an outstanding attorney, with a thriving law office had dinner with his closest friend, Chicago coal dealer Silvester Schiele, who had hired Paul to collect a $10.00 debt owed to him. Afterwards they walked up to Room 711 of the Unity Building where they met their host, Gustavus Loehr, a mining engineer; and another friend, Hiram Shorey, a merchant tailor. With some serious reservations about our own safety and wellbeing for the next two weeks, my wife and I were aboard a Boeing 747, traveling to the Philippines. The trip followed my year as district governor in 1992-93, in which Rotary clubs in district 5830 teamed up with Rotarians in the Philippines to obtain and successfully complete a Matching Grant there. For our part, this was the culmination of a dream come true. Rotary butterflies come in all sizes and backgrounds. Many of them require help from others who posses the needed resources unavailable to them. Often, that means bringing those resources great distances at great cost. In many cases this involves Rotary clubs, as was the case with the two Rotary clubs above. Rotary International's Foundation also became a partner (butterfly) in this heartwarming story, as told by our late Past President Jim Taylor. The fascinating history of Marshall Rotary is filled with stories of ordinary men and women doing ordinary things; many times, with extraordinary results. To visualize and understand an entity as old and complex as the Marshall Texas Rotary club, is to think of it as a giant transparent balloon filled with butterflies. Anyone outside of the balloon can see the butterflies, but the only way to really know how the Marshall Rotary club has changed, or is changing the world around it, is to study those butterflies; in this case, two very special butterflies, Gail Beil and Sebastian Hammann, who were drawn into the “Rotary balloon” through a Rotary International program called Rotary Youth Exchange, which encourages high school students in one country to spend a year as a student in another country. The Rotary Club of Marshall Texas is often thought of as an “exclusive Old-Man’s club”. In the beginning that was, in a sense, true, but only when observed from outside. The founders of Rotary International were relatively young businessmen in their forties and fifties, as were most of the founders of the Marshall Rotary club. Many of them stayed in the club for thirty or forty years and did, indeed, attain the status of “old men”, but young or old, they were all boys at heart, and one of their missions was to see that boys and girls in Marshall had the same chance for a better life as they did. Six months after being admitted into the Rotary International organization, the club held a Father-And-Son banquet in the Hotel Marshall, the purpose of which was to “learn more about the young men and give them the unusual opportunity of meeting the businessmen on a common plane”. The Rotary Club of Marshall Texas has sponsored four clubs. The first was the Longview club in 1929, the Carthage club was co-sponsored with the Center Rotary Club in 1945, the third was Marshall -Metro in 1981, and the last was Hallsville. The most challenging sponsorship was Hallsville in 1988, which already had a strong, well established, and functioning Lions club. Moreover, there were no Rotarians living in Hallsville and there was no interest in starting a Rotary club by anyone living in Hallsville at the time. 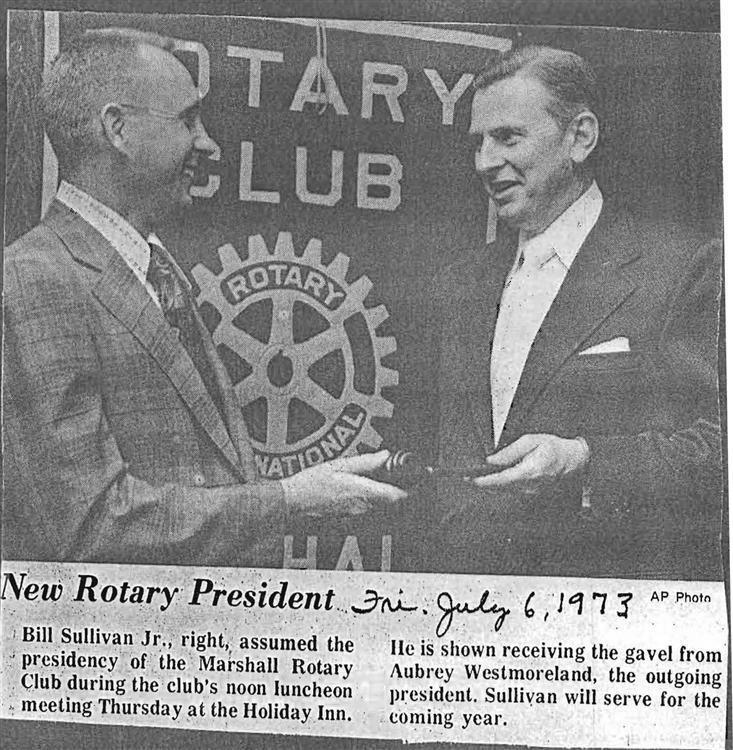 None the less, during his official visit to the Marshall Rotary club, September 7th & 8th, 1988, District Governor Tom Bagwell challenged the Marshall club to start a new Rotary club in Hallsville. 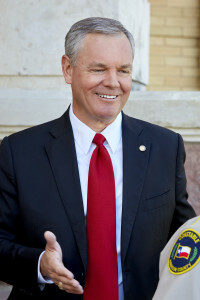 Rotary president, Jim Fitzgerald, not wanting to let the governor down, said he would try. As soon as he could, he met with his friend Admiral Sam Moore, and ask him if he would take the lead in starting a new club in Hallsville. Sam’s answer was “yes”, and a most unlikely enterprise had begun. Harrison County Judge Hugh Taylor updated the Marshall Rotary club yesterday on the progress of I-69 (now I-369) yesterday, and held a large crowd’s attention, as he described the progress being made on the Marshall, Harrison County portion of the proposed interstate highway, and how the funds are being spent. The club Strongly Suppored his work on Harrisson Count's and Marshall's behalf. Nighty eight years ago, County Judge W. H. Strength stood before the same club and made basically the same speech, before an enthusiastic audience. The topic, however was not Interstate highways, but seeing that we have good gravel roads, at a price not exceeding the $8,000 approved on the bond issue, previously passed by the voters. The Rotary club moved that the club go on record as supporting Judge Strength. We are proud of Marshall Rotary for supporting good roads, in these two instances and others too numerous to include, for nighty-eight years and counting. 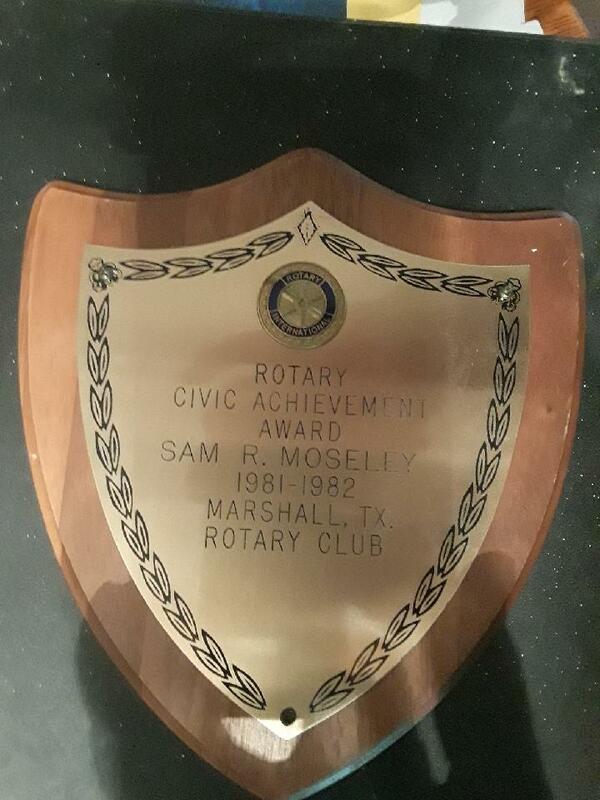 Created in 1976, The Marshall Rotary Civic Achievment Award was given to active Rotarians in recognition of their service and contributions to the local community. One of the most profound moments in the history of the Rotary Club of Marshall Texas happened Thursday April 27, 1987, at 12:46 p.m., during the regular Meeting of the club, as reported by Laureen Tedesco of "The Marshall News Messenger". 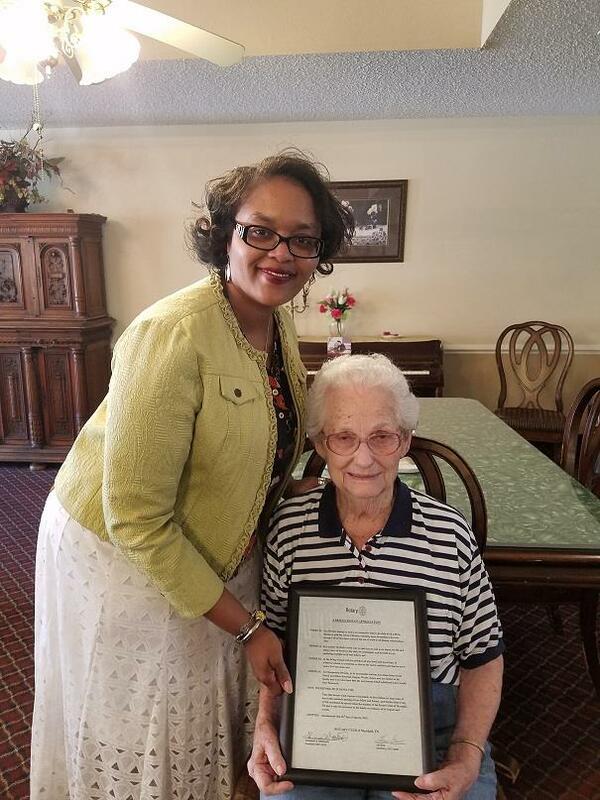 Two women were inducted into the club--- Mrs. Carolyn Abney, and Mrs. Patti Harris. The first annual Faux Paws Dog Walk was the brainchild of Karen Partee, wife of Bryan Partee, a Rotarian in the Marshall Rotary Club. Karen and Bryan were the adopted parents of two shelter-held Dachshunds who captured their hearts and filled their lives with joy and companionship. "In 1919 my dad was visiting in the office of Arthur A Everts in Dallas when it became time for Mr. Everts to go to the Rotary club (club number 39), he invited dad to be his guest. Dad was so impressed with this meeting that he asked if a suburban club could be organized in Longview and he was told that such a thing could not be done." "A few days after returning to Longview his good friend, Ike Hochwald, of Marshall was in Longview and came by and talked to dad on his wonderful experience of being invited to attend a Rotary meeting in San Francisco [Dallas]. He and dad were so thoroughly sold on the ideals of Rotary that they decided to try to do something about organizing a Rotary club in East Texas." Others recounted that the organization meeting was held on April 20th, 1920 in a room on the 2nd floor of the municipal building which was located just West of the present Grover-Crim Building. The ground floor was the fire station and the city officers were on the 2nd floor. R M Kelly and most of the others who became charter members were present at this meeting. Ike Hochwald and Frank Davis were two Marshall Rotarians present. Rotary International admitted the Longview club to membership on May 1st, 1920, and the charter night dinner was held that night in the Magnolia Hotel. Rotary District Governor Lutcher Stark of Orange appointed as his special representative Ike Hochwald of Marshal,l who presented the charter, and the Longview Rotary club became the 715th club in Rotary was officially in existence. The weekly meeting day was set as Tuesday and it has remained so throughout the entire history of the club. there meetings continued there for many weeks at the Magnolia hotel. What had begun as a friendship between two men, became a strong bond between the two clubs, uniting them in the Ideals of Rotary Fellowship and Service, taking something that “could not be done”, and getting it done, and, in so doing, impacting thousands of lives, and changing the future of Marshall and Longview forever. These benches were originally placed at the area now known as Telegraph Park, which was, at the time, a place for visitors to relax and enjoy the downtown scene, know as "Rotary Park". There were 4 benches, in total. When the city took over that area and created the Telegraph Park, the benches were removed and stored at the Sheriff’s secure storage area. They had been pushed to the back of the building and moved, numerous times. I asked the club for suggestions on where to prominently place them for a visual “advertisement” of Rotary. 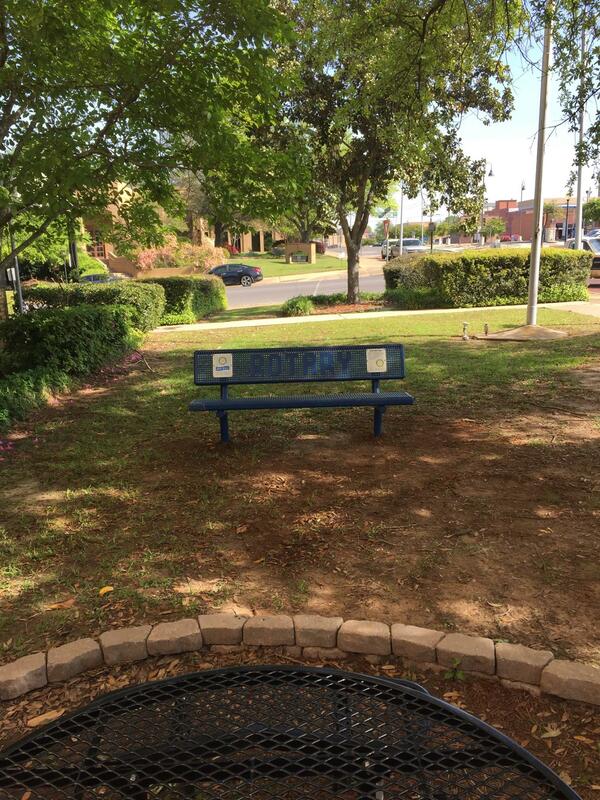 The benches all have the 4-way test and the Marshall Rotary logo as well as the “ROTARY” stamped in the back rest. The Harrison County Building Maintenance supervisor, Mark Knuckols accepted 2 of the benches to be placed at the front visitors entrance to the courthouse. They were removed from the storage area, cleaned, and permanently placed in the area on Wednesday, April 12, 2018. The other 2 are still in storage and waiting for a suitable location to be accepted. One of them has damage to a leg, but could be easily fixed. For Information please contact Jay Webb. The Rotary Club of Marshall Texas accepted the Challenge of 2017-18 Rotary International President, Ian H.S. Riseley, to develop projects with Rotaract and Interact Club support and collaborate with community partners and local experts by planting a tree for every member of the club. The goal was to PLANT A TREE by Earth Day, April 22, 2018. Since it was organized in 1919, The Rotary Club of Marshall Texas has been a strong supporter of education for boys and girls of Marshall and Harrison County. This year, all fifty trees were planted one month ahead of schedule, March 3, 2018, by Marshall & Marshall-Metro Presidents Louraiseal McDonald, and Charles Cornish, other Marshall Rotarians, Interactors, Rotaractors, RYLA campers and friends and family at 5 brand new MISD campuses in Marshall. Congratulations, Marshall Rotary! This is a updated, enlarged and revised list of scholarship recipients. Edgar F. Allen’s son was killed in 1907 in a tragic street-car accident in which 80 others were injured or crippled. In memory of his son who might have lived, and those devastated by the crash, Edgar Allen, recognized a need and started work with other friends. By the fall of 1908 the new and modern Elyria Memorial Hospital opened its doors. In September 1915, the Gates Hospital for Crippled Children was opened as the Children's Orthopedic Unit of Elyria Memorial Hospital. Wesley Jones was president of the Rotary Club of Marshall Texas 1957-58. A Memorial Resolution as follows was drafted and approved by the club and handed to his precious wife Jeane. March 26, 2018. A moving tribute can be viewed at on the Sullivan Funeral Funeral Home Website. Birth of the Rotary "FOUR WAY TEST"
of the things we think, say or do. There are several ways to describe what Rotary is all about. One is the slogans that we use, "Service Above Self”, and “He Profits Most Who Serves Best". They are certainly a high and noble ideal that has lifted many a man or woman out of themselves and set their vision on the heights. Another ideal around the world is "The Four Way Test" and it is one of the most famous statements of our Century. Like most things worthwhile, it came into existence because of one man. Great things are not normally accomplished by a committee. Most things of value in this world have been done because of a special person. Great things are done by human beings, who are committed to a cause. I want to tell you about The Four Way Test and Herbert J. Taylor, a man of action, faith, and high moral principle. Born in Michigan, he married in 1919 and moved to Oklahoma where he worked for the Sinclair Oil Company. After a year, he resigned and went into Insurance, Real Estate, and Oil Lease Brokerage. He was a mover, a doer, a consummate salesman, and a leader of men. In 1926, Will Pitts, president of the Marshall Texas Rotary club was invited to present a program at the Rotary International Convention, which had gained international recognition by helping boys in the county. That program was started in 1921 with a loan to a farm boy named R. Levy Craig to buy a pure-bred sow. The young man was required to sign a note, at 6% interest and repay the loan after he sold the pig, so that the money could be loaned to another deserving young farm boy etc. A similar offer was made to three Harrison County girls who were loaned $25 each to buy setting hens and pure-bred setting eggs, to be paid back at 6% interest after one year. The funds were donated by the Henry Exall Loan Fund and Marshall Rotary was chosen to find a boy and three girls for this program and, with the assistance of the County Agent and the Home Economics Extension Agent, follow them throughout the year and “encourage them in every way possible”. Ironically this appears to be the only year such a program like this was undertaken by the Marshall club, but, another such loan program was almost certainly a direct outcome, the Marshall Student Loan Fund, 1923 - 1948, using the exact same rules as the Henry Exall Loan Fund, helped over 150 students attend the college of their choice during those 25 years. Congratulations to The Rotary Club of Marshall Texas for taking a good thing and making it better. Facebook is the best kept secret of the Marshall Texas Rotary club, but not for long. That has to change. Our club is going to be a lot more fun and better informed because of this new tool. Web sites and emails are becoming obsolete and Social Interfaces like Facebook are going to be a huge boost to our productivity in the future. We have had a Facebook site for several years and there are several members who have been posting to the site all along. For the rest of us this is going to be a learning process for awhile, but as we become more comfortable using it, we will soon realize what a neat tool it is. April Spears is working on the format, setting up some things for us to use, and straightening out some bugs now, but in a few weeks, we will be sending everyone instructions as to how to get on and use it. If you are a big Facebook user now, and search for "Rotary Club of Marshall Texas" and browse the things that are already posted. You will be amazed. On 23 February 1905, Paul P. Harris, Gustavus Loehr, Silvester Schiele, and Hiram E. Shorey gathered in Loehr’s office for what would become known as the first Rotary club meeting. Initial early meetings of this group of men were held at their offices in "rotation", hence the name "Rotary" was eventually chosen as the name for the club. Rotary’s founder, Harris, was born in Wisconsin, USA, on 19 April 1868. He was raised by his paternal grandparents in Vermont and attended the University of Vermont, Princeton, and the University of Iowa. He was Rotary president from 1910 to 1912 and a member of the Rotary Club of Chicago until his death on 27 January 1947. Learn more about the founder. Loehr, a mining engineer, was born on 18 October 1864 in Carlinville, Illinois. He was a Rotarian for only a few years, never holding office at the club or international level. But that first Rotary meeting was held in his office, Room 711 of the Unity Building in downtown Chicago. He died in Chicago on 23 May 1918. A Rotarian for only a few years, Shorey served as recording secretary during the club’s first year. He was born in Maine in August 1862 and died in March 1944. Schiele, a coal dealer, served as the Chicago club’s first president in 1905 and Rotary International’s third treasurer in 1945. Born in Terre Haute, Indiana, in June 1870, Schiele attended Terre Haute Business College and served in the U.S. Army during the Spanish-American War. Originally from Michigan, Ruggles was a graduate of Northwestern University in Evanston, Illinois, and joined Rotary at its second meeting. He was treasurer of the Chicago club during its first year, president from 1908 to 1910, and a Rotary director from 1912 to 1913. He is known for having introduced singing to Rotary club meetings. His printing company, H.L. Ruggles & Co., printed the first issue of The National Rotarian and the first Rotary songbook. What do you do when you start a new club? You look for a need and fill it! In 1906, realizing the importance of community service, Paul Harris persuaded the Chicago Rotary Club to initiate the establishment of public comfort stations in the city of Chicago, inviting the city administration and every civic organization in the city to join the new club in the undertaking. It is possible that some more attractive objective might have been chosen for the first community service venture, but it would be difficult to have found one which would have stirred up more agitation. Two formidable forces rose up against this project; one was the Chicago Association of Brewers which contended that every one of Chicago's six thousand saloons offered public comfort conveniences for men. The other opponent was the Association of Department Stores on State Street which contended that free accommodations in their stores were available to women. The proponents of the measure nevertheless persisted that men ought not to have to buy a glass of beer nor women have to buy merchandise to make use of toilet facilities. The stations were established. The story behind the man, Issac "Ike" Hochwald, The Founder and First President of the Rotary Club of Marshall TexasThe story of the early beginnings of The Rotary club of Marshall Texas is a story of a few business men who were actively involved in the social and business issues of the community of their day. Years in the making, Rotaract has arrived in Marshall Texas! Organized last December, the Rotaract Club of Wiley College, sponsored by The Rotary Club of Marshall, has already completed a project in support of the hurricane ravaged Houston area, and assisted the Marshall club in preparing 900 dictionaries for distribution to all of the third-graders of Harrison County. Way to go Wiley Rotaractors. A “white way”, was an obsession for years of W. A. Adair, President of the The Marshall Messenger newspaper, which launched a media blitz in 1916 culminating in August and September of that year. Those two months, on an almost daily basis, he used every resource at the disposal of his newspaper, trying to convince the merchants and citizens of Marshall of the need to have street lamps installed from the depot to the courthouse on N. Washington street in front of every business. Fast-Forward three years to September 4, 1919; one month after the Marshall Rotary club was chartered, and they took up this cause as their first “Community Service” project. The headlines read: “Rotarians Hustling On The Matter of Light”. In less than three months the white way was a reality. W. A. Adair finally got his white way, but, a competing newspaper’s (The Marshall Morning Messenger) editor Homer M. Price and its business manager Bryan Blaylock, had become a part of the story now. Homer and Bryan, as members of the new Marshall Rotary club became an active and vital part of a three-month, in-your-face, door-to-door, “ROTARY BLITZ”, which finally brought the “White Way” to Marshall. What a beautiful difference it made. Lansing Irvine was Chairman of the “Entertainment Committee” for charter president Ike Hockwald. Since he was the very first chairman of this committee he had to come up with some novel thoughts on just what would entertain this bunch of middle-aged businessmen but had to look no farther than his mischievous childhood for inspiration. He just treated them like children. He was always looking for ways to improve the attendance even capitalizing on wagers to win the District “100%” attendance award. His Entertainment Committee Chairman was “Andy” Anderson, an overgrown child himself, conceived a scheme/wager to have a 100% meeting August 11th, and a letter went out to that effect on the 10th. On the day of the meeting, it was learned that one of the members was sick in bed. Andy promptly got permission from his physician to bring him to the meeting and hired a taxi and sent two Rotarians to his house to pick him up and bring him to the meeting room, among prolonged cheering. The loser, Frank Davis happily paid the $50 to Andy, and everyone cheered Frank as well. But that is not the “end of the story”. You have to be at next week’s meeting to hear Jay Web reveal what was in the letter that made it so effective. Lansing attended school in Marshall, and a military academy in N. C. Lansing Switch was named after him by his father Hugh R Levine. He worked in the offices of the T&P railroad before moving to Marshall, where he worked briefly in the railroad stores department. He married Miss Lulu Fry in 1901, making him the son-in -law of Major E J Fry, owner of Fry-Hodge Drug and worked for him over a quarter of a century, he became manager of Fry-Hodge Drug, and eventually President. He and his father-in-law joined the Rotary club in 1919 as charter members. His classification was “Retail Drugs”. The entertainment committee kept the interest and attendance up, but Lansing didn’t stop there. He served as the second President of The Rotary Club of Marshall in 1920-21, sandwiched between two of the icons of the Marshall Rotary club, Lancing Irvine was his own man, confident and resourceful, he saw unmet needs, unresolved problems, and believed that Rotary could help. Lansing was a true Rotarian who believed in putting his “clout” behind his words and the Rotary Club of Marshall Texas and the city of Marshall were beneficiaries of his leadership throughout the year. At the end of his year, he had a huge banquet, celebrating his year by opening the meeting with a “Bung Starter”, a relic of the past, which he was soon to be, but honoring the many accomplishments that had been done in less than two years. Early in his year he asked for and got approval to create a Public Affairs committee and four sub-committees to study and bring back recommendations to the club. improve, upgrade, and expand the city’s water supply system. The successes he had, set the pattern for future presidents, and Marshall Rotary became a force to be reckoned with for the next 99 years! Bill Sullivan, Jr. was club president in 1973-74. As he recalls, he came very close to being the first Rotary club president to be impeached. Several highly respected members of the club had called his attention to lagging attendance recently, and urged him in no uncertain terms to "fix" it. Attendance, which was the unofficial standard by which every club president was judged at that time, was lagging far below what they considered acceptable. Those of you who know Bill, know that "duty" comes first. Also, you know that he is a strong proponent of rules and tradition as well. The most important rule at the time was that, attending Rotary meetings should be the first priority of club members. As president of the club, therefore, he felt it was his "duty" to "fix" this "lagging-attendance" problem. At the time, the answer seemed simple enough. He would need only to "feed" the ego of this distinguished group by appealing to their palates, so he casually announced that the main course for an upcoming meeting would be T-bone steaks, and invited everyone to come and enjoy. Everyone was excited, of course, and the word spread very quickly that Bill had "upgraded" the main course to T-bone steak. Sure enough, a huge crowd showed up, fully expecting to sit down and enjoy a T-bone-steak at Bill's expense. (Don't get ahead of the story!!!) The steaks were there as promised, but to their surprise when they arrived, there was no silverware on the tables to eat them, none! Knowing that the T-bone steaks would cost more than the regular meal, Bill crafted a novel way to cover the extra cost without distressing his budget, and, possibly, he thought, introduce some "humor" into the meeting as well. So, he secretly arranged with the president of the Lions' club to have several of his members "conveniently" seated at a table "selling the silverware for the meal". To be sure, he succeeded in increasing attendance that day, but sadly, not so much adding humor. Fortunately, the talk of "Impeachment" died down eventually, and Bill, much humbled, had to find other ways to "fix" the "lagging-attendance" problem. On June 20th 1919, Robert Dorough, Special Representative of Governor Reed of Beaumont, sent this letter to the Secretary of the International Association of Rotary Clubs in Chicago. Herewith I have the honor of transmitting for the consideration of the board of directors of The International Association of Rotary Clubs, the application for membership from the Rotary Club of Marshall, Texas. This club was instituted on the 10th day of June, 1919, by Robert P. Dorough, of Texarkana. Marshall, being only 60 miles from Texarkana, and knowing a large number of the business men of that city, I recognized that if I could interest the right men, it would support a real Rotary Club. Having been associated with Ike Hockwald in other matters, I had no trouble in securing his consent to take charge of the preliminary details. District Governor Reed, of Beaumont, appointed me as his Special Representative. The club would have been organized earlier, but war work and allied matters occupied all our time in the latter months of 1918, and from January to the last part of May, 1919, I was engaged in discharging my duties as State Senator. The club has a live bunch of boosters, and I am sure Marshall will reflect credit upon Rotary. The club has adopted the standard Constitution prescribed by the Association for local clubs. The club has a satisfactory charter list of members as is indicated by the list attached to its application. This club has duly elected its members. I recommend the election of this club as an affiliating Rotary Club. The Interact Club of Marshall had its first meeting November 13, 2017. Since then the Club has strived to adhere to our motto of “Service above Self”. We met with the Humane Society and began to volunteer at the organization, donated 84 pounds of food to Mission Marshall for World Interact Week. Also on Saturday, December 16th we went out to Heritage House and decorated the doors of the residents for Christmas. Six students, Ilse Torres, Bianca Hernandez, Samantha Reeves, Learondra Reese, Dante Enrriquez, and Dakota Epps, along with the Rotary president, Louraiseal McDonald, and Marshall High School sponsor, Marilyn Anderson went hall to hall greeting residents with gifts bags, and decorated their doors with small ornaments, bows, and wrapping paper. The Club wants to give a special thanks to Pet Place for allowing us the opportunity to volunteer at the facility, and to help animals in need, something the Club is passionate about. We would also like to thank the Rotary Club District 5830, La Quinta Inn, Hampton Inn, and Comfort Suites for donating supplies to the club for our Heritage House service project. Lastly, we would like to thank our sponsors, Marilyn Anderson and Stacy Adams, for mentoring the club and giving the students a chance to create something that can allow us to give back to our community. This is how it all began nearly 100 years ago with this submission of this list of charter members and their classifications to the International Association of Rotary Clubs, Chicago, IL Remember, this was 1919, and the horse and buggy were still a vital part of commerce and mail delivery. Notice the classification of Charter Member, E. W. Mahone. Imagine how long it took to get F. A. Alexander's name corrected in Rotary's records (if it was actually submitted as shown in this article of the Marshall News Messenger). Notice E. J. Fry's classification. He was a banker, at the First National Bank but at that time you couldn't have two men with the same classification in a club; and Will Pierce who was employed at the Marshall National Bank was listed as a "Banker", so E. J. Fry chose to be classified as a "Capitalist". The club was officially recognized and chartered August 1, 1919. These and many other fascinating stories will be revealed in the coming months as we dig into the past and post the stories, while we count down to the 100th Anniversary of Rotary in Marshall. Aexander, F.A. "Moving Pictures, Theatre"
Carter, August G. "Wholesale Produce"
Hon. T.W. Davidson, "Attorneys at Law"
Hirsch, Joe "Retail Dry Goods"
Mahone, E.W. "Saddlery & Buggies, Retail"
Pelz, H. E. "Retail Jeweler"
Stacy Adams made the initial contact with MISD in October to start a new Interact club at the high school, and has several Members lined up to be Interact Counselors, and the club now has over 25 member signed up, and held its first meeting October 30th. The Marshall News Messenger reports on Marshall Rotary Club's first African American female President. The Rotary Club of Marshall, Texas, installed its first African American female President - Harrison County's family and consumer sciences county extension agent, Louraiseal McDonald. Louraiseal is excited about her term as President of Marshall Rotary Club. "I'll be the club's 98th President, sixth female President and the first African American female President, she said " What an honor." "This club will be 100 years old in 2019" she added. "That's a major milestone." Thank You Rotary. The end is in sight. this is Rotary's finest hour. Marshall Rotary's "Parade of Flags"
In August 2011 the Rotary Club of Marshall put out its first 86 flags for Labor Day and the remembrance of "9-11" (September 11, 2001). 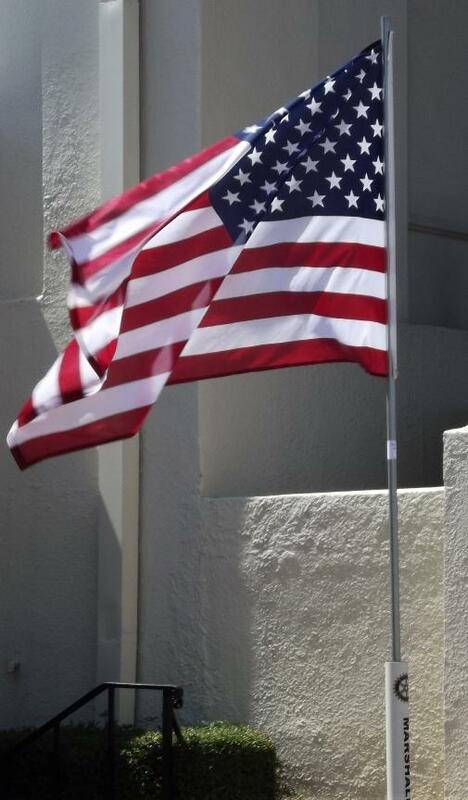 Since then we have put out approximately 5,000 flags at the Holidays over the last 7 years. As a sign of our respect for the gallant men and women who serve our country in the military, our diplomats and staff who serve in harms way all over the world, as well as all of the Law Enforcement officers who protect us here at home; Rotary clubs across the nation recite the Pledge of Allegiance at every meeting. From Keith Feille, chairman of the flag committee come these words "We have 730-PLUS flags out this week with more orders coming." Halfway through the second year of Marshall Rotary's Parade Of Flags project, we are far ahead of subscription expectations, and thanks to dedicated flag team leaders and everyone else who has pitched in, our finances are rock solid. We have moved our flags and other equipment to secure storage buildings now, where they can be inspected and repaired as needed, and replaced when necessary. Our heartfelt thanks to Sullivan's Funeral Home for letting us use their equipment storage building to help us get started, which allowed us to purchase and assemble the initial flags and time to develop a strong customer base. In 1919, my dad was visiting in the office of Arthur A. Everts in Dallas. 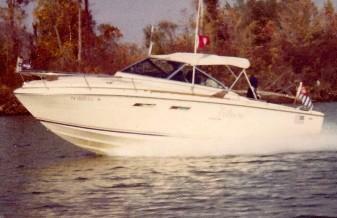 When it became time for Mr. Everts to go to the Rotary Club (Club #39), he invited dad to be his guest. Dad was so impressed with this meeting that he asked if a suburban club “could be organized in Longview, and he was told such a thing could not be done. A few days after returning to Longview, his good friend Ike Hockwald of Marshall was in Longview and came by and talked to Dad on his wonderful experience of being invited to attend a Rotary meeting in San Francisco (Dallas?). He and Dad were so thoroughly sold on the ideals of Rotary that they decided to try to do something about organizing a Rotary Club in East Texas. Ike Hockwald was so enthusiastic that he got a group of Marshall men together, and they organized the Marshall Rotary Club in 1919. After the Marshall Club received its Charter, Ike Hockwald came back to visit Dad, and they, with other Marshall Rotarians organized a provisional Club in Longview. Ike had an overriding desire to serve beyond himself. He fathered not only the Rotary Club of Marshall. but also was recognized as the father of organized baseball in Marshall bringing to Marshall teams that brought distinction to the community; and was a driving force in forming a Marshall Lodge of the Benevolent and Protective Order of Elks. in which be held the highest offices and who, in his later years. annually was publicly recognized by the lodge at special "Ike Hockwald Appreciation" meetings; and, for nearly two decades he served as chairman of the Rotary student loan fund, later to become the Marshall Rotary Scholarship fund, to which he was extremely devoted. He served unselfishly in all programs for community betterment. giving of his time and efforts to long service on the Marshall School Board; contributing generously to Kahn Memorial Hospital. which was named at his suggestion in recognition of the largest contribution for its erection; was recognized by the Boy Scouts of America with its highest award, the Silver Beaver, to adult benefactors; and distinguished himself as a Mason; and his affiliations with the Marshall Chamber of Commerce, the East Texas Chamber of Commerce, and other civic groups earned for him the deserved recognition as an outstanding civic leader. The man who was instrumental in organizing the Rotary Club of Marshall was a man of many interests, and extraordinary vision. 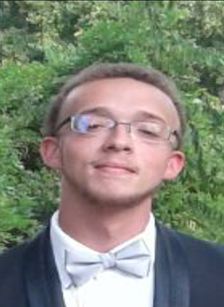 Sam Moseley reports that Thursday has been "Rotary Day" for him as long as he can remember. His father, Haywood Moseley, was a long-time dedicated member of Marshall Rotary Club. Sam graduated from Marshall High School, The University of Texas, and The University of Houston College of Law before returning to Marshall with his wife, Kay, also a Marshall native. Sam served as Marshall’s Assistant City Attorney and opened his private law practice in 1970. His brother, Bailey, now Justice on the 6th District Texas Court of Appeals, became his partner in 1971. Sam was inducted into Marshall Rotary Club in 1972 and served as President in 1976-77. He was chairman of the District Conference in 1980. In 1984, Sam was selected to lead the Group Study Exchange team to Uruguay. For five weeks, the team of young men served as ambassadors and students throughout the country of Uruguay, and Sam was made a lifetime member of the Rotary Club of Montevideo, the oldest Rotary Club in the Southern Hemisphere. After serving from 1984 to 1993 as an appointee in the presidential administrations of President Ronald Reagan and President George H. W. Bush, Sam returned to Marshall and resumed his membership in Marshall Rotary Club. He was the first person ever to serve as President of the club two times when he took office in 2000. Active in many civic organizations, Sam has seen service on the Boards of East Texas Baptist University, Marshall Public Library, Marshall Memorial Hospital, Harrison County Historical Society, Marshall National Bank, Courthouse Preservation Council, Marshall Main Street, and Marshall Chamber of Commerce, among others. He was named our city’s Outstanding Citizen in 2006. Sam appreciates the many ways Rotary allows us to serve our fellow man and enjoys the many friendships formed through Marshall Rotary Club. He has found that Rotary offers "avenues of service" to those who seek it at any age, as he has proved in nearly 40 years as a Rotarian. He and Kay have two grown children, and two grandchildren, Hallie (age 11) and Ben (age 9) who bring them great joy. Kay and Sam are both Paul Harris Fellows. Can you guess who this Rotarian is? She joined the Marshall Rotary club in 2002, sponsored by Frank Dias no less. Well that could be any of about half the current club membership couldn't it? Maybe this will help. She & her husband are avid boaters, having boated in the waters of Texas, Arkansas, Louisiana, Mississippi and Oklahoma, to Cape Cod; the Chesapeake Bay, through the Dismal Swamp into North Carolina, from the eastern shore of Maryland up through C & D canal to Cape May. The most memorable experience was their trip to the Bahamas, thru the Bermuda triangle, on their very own 24 foot, single engine boat. As you might expect, it was sheer terror from start to finish, including a cracked engine block, gas pouring into the bilge, 4-foot seas, running out of gas, and no land in sight. Well the boat and all aboard survived, as did the marriage, but only after some serious apologizing by the boat's Captain to the first mate. Have you guessed yet? No? Well, it might help to know that she is a NATIVE BORN TEXAN! whose family moved to Shreveport, Louisiana, where she graduated from the GREAT C. E. Byrd High School. The year of course, is none of your business! From there she was off to the University of Arkansas where she had spent many summers with aunts, uncles and cousins, and put lots of Arkansas mud between her toes. Oh, those Arkansas Mountains, those Razorbacks, and those U of A fraternity boys! Who could want anything more? July 1, 2011, is a new beginning with 2011-12 President Linda Endicott and her officers. Lets be there to help mark this special occasion! Why does Rotary "fire" every one of its executives every year? Rotary does this to insure that it doesn't become stale and predictable, and to infuse new ideas and new life into the organization. In a larger sense it is Rotary's way of saying we trust these new officers, because we only pick the very best to be members to begin with, and we train them well. So it has been from the beginning, August 1, 1919-June30, 1920, with Ike Hockwald, and has continued through this year, July 1, 2010- June 30, 2011, with Yours Truly in charge. Just reading the names of all the past Marshall club presidents is like reading the Who's, Who of Marshall. But, they all got fired (some twice) and the Rotary Club of Marshall is better for it. Our speakers on June 9 were the State Game Warden, Todd Long, and the Jason Roesner from Caddo Lake National Wildlife Refuge. We saw a short video on what Game Wardens do and had a question and answer time. It was a great program and we are glad these two joined us! Who Will Take My Place? Who will you bring into the club to fill my seat at the table? The club had a lot of members with my classification, banking, when Bush Morgan, invited me to join the club in 1990, and now there are only a few left. Maybe the one who replaces me will be in banking too. Who will you get to help Louraiseal pick and choose the Diploma Plus students and select the Scholarship recipients now that I will no longer be there to help her? Who will fill this vital role now? I hope it will be someone who cares for young people as much as I have. Who will pick up where I left off with Project Amigo and keep the relationship with our sister club alive now? The needs are no less urgent and the opportunities no less available than when I first searched and found them years ago. I hope you will find a place for those extended family members in your hearts and prayers. Who will help you remember the Rotary Foundation in your planned giving, and assist you in making your gift? Please don’t let the things that mattered to me in Rotary die. Sign up & Events at 9 am. 1 mile Walk is at 10 am. Maybe they’ve seen a need in our community and wondered how they could help. Maybe they want to use their professional skills to help others — or even learn new skills. Maybe they’re seeking connections with other service-minded professionals in our community or abroad. Whatever their reason, joining Rotary can help them achieve these goals, and so much more. Rotary celebrates India’s first polio-free year. from Rotary International on Vimeo. R otary club members worldwide are cautiously celebrating a major milestone in the global effort to eradicate polio. India, until recently an epicenter of the wild poliovirus, has gone one year without recording a new case of the crippling, sometimes fatal, disease. India’s last reported case was a two-year-old girl in West Bengal State on 13 January 2011. The country recorded 42 cases in 2010, and 741 in 2009. A chief factor in India’s success has been the widespread use of the bivalent oral polio vaccine, which is effective against both remaining types of the poliovirus. Another has been rigorous monitoring, which has helped reduce the number of children missed by health workers during National Immunization Days to less than 1 percent, according to the World Health Organization (WHO). Rotary has been a spearheading partner in the Global Polio Eradication Initiative since 1988, along with WHO, UNICEF, and the U.S. Centers for Disease Control and Prevention. The Bill & Melinda Gates Foundation is also a key supporter of the initiative. Sporting their signature yellow vests and caps, the nearly 119,000 Rotarians in India have helped administer vaccine to children, organize free health camps and polio awareness rallies, and distribute banners, caps, comic books, and other items. “With the support of their Rotary brothers and sisters around the world, Indian Rotarians have worked diligently month after month, year after year, to help organize and carry out the National Immunization Days that reach millions of children with the oral polio vaccine,” says RI President Kalyan Banerjee, of the Rotary Club of Vapi, Gujarat. Deepak Kapur, chair of the India PolioPlus Committee, also credits the Indian Ministry of Health and Family Welfare for its commitment to ending polio. To date, the Indian government has spent more than US$1.2 billion on domestic polio eradication activities. “Government support is crucial if we are to defeat polio, and we are fortunate that our government is our biggest advocate in this effort,” Kapur says. “Marching ahead, the goal is to sustain this momentum,” he adds, describing as potentially “decisive” the upcoming immunization rounds this month and in February and March. If all ongoing testing for polio cases recorded through 13 January continues to yield negative results, WHO will declare that India has interrupted transmission of indigenous wild poliovirus, laying the groundwork for its removal from the polio-endemic countries list, which also includes Afghanistan, Pakistan, and Nigeria. However, because non-endemic countries remain at risk for cases imported from endemic countries, immunizations in India and other endemic and at-risk countries must continue. Neighboring Pakistan, which has reported 189 cases so far for 2011, is a major threat to India’s continued polio-free status. Last year, an outbreak in China, which had been polio-free for a decade, was traced genetically to Pakistan. From Marshall News Messenger, June 13, 1919. It is a significant fact that out of the meeting held yesterday afternoon in the Elk's Club room, a local chapter of the Rotary Club came into being, and a new era in the work of getting together for co-operative benefit among the business houses of Marshall was marked there. Senator Durrough, of Texarkana, came down yesterday at the invitation of a number of enthusiasts here, and organized this branch which will become, automatically, a unit in the great world Rotary Club, which has proved itself a most wonderful force for betterment. It is often asked what the Rotary club stands for and what the idea of its establishment is. In the first place, the organization is not to supplement or replace in any way the Chamber of Commerce. Working together, the two build for the growth of cities and the stimulating of interest to bring about a change in business from the old methods to the new ones. The ideas of brilliant and successful men in all parts of the United States, as well as in foreign countries, are brought to each chapter for its use and when they are put into practice they bring new life and new blood-strong remedies to fight off the most deadly of all sedatives, stagnation. All legitimate business is recognized by the Rotarians as being for one purpose--to establish moral strength and efficiency, to make the minimum labor produce the maximum results. The Rotary club looks today for the carrying out of new ideas. It does not just dream of them and talk of them. To be a successful member of the club one must continually put into practice the solutions offered for problems threshed out around the table where the meeting is held. that he may emerge to be a greater benefit to his home and his community. With a Rotary Club and a Chamber of Commerce, Marshall may look to a bright future. The Club will hold its first meeting Thursday, June 19, 1919, at 12 o'clock, noon, and the initial program will be accompanied by a luncheon. Past Rotary Club President's Installations. A couple of the "Old Guys" (Bill & Sam) looked different "Way Back When", Nice ties, though. Looking good as always! Cecil Tomlinson was a salesman for, and later became, the manager of Southwest Meter & Supply here in Marshall. Cecil resisted all efforts to enlist him, using the excuse that he was a traveling salesman, and could never meet the rigorous attendance requirements of the Rotary club. Cecil finally relented when he was told that he could “Make up” meetings at other Rotary clubs and take his clients out to a meal and interesting speakers as well. Cecil immediately joined Rotary in 1980 and began collecting makeups almost daily all over his territory. Thinking that he had accumulated enough makeups to last 6 months or more, beaming with pride, he turned them in at the next Rotary meeting. Imagine his surprise when he was told that he could only count two of them (True Story). From then on, Cecil arranged his sales schedule so that he could make the meetings on Thursday in Marshall, and probably still holds the all-time record for makeups, and became the most knowledgeable new Rotarian in the district. He went on to become president of the Marshall Rotary Club in 1984-85, an extended Paul Harris Fellow and Benefactor. Cecil served as District Governor of District 5830 during 1987 to 1988 and was the representative from our District to the Rotary International Council on Legislation in 1992. For many years he was on the District Youth Exchange Committee, and he served as the Rotary International team leader and led a Group Study Exchange team to India. He was also extremely involved in the District Rotary Foundation Committee. Cecil was active in community, business and civic affairs in Marshall. This is not a Lion’s Club Meeting. It is the first meeting into the 2001-12 Rotary year, of the New Board & Committee Chairs of the Rotary Club of Marshall, at Catfish Express, July 26th. The food was great and the agenda was full of things to do, including; our reviewing our finances, past and planned, our membership & attendance issues and planned stratgies, various committee reports on our fund raisers and various projects that are in process or planned. This bunch got right to it, starting with a detailed discussion and comments on the club’s finances and finishing up and hour later by approving a new plan proposed by The Rotary Foundation Chair, Bill marshall, to make 37 new Paul Harris Fellows this year. You needed to be there to appreciate the dedication and commitment of this new ROTARY Board. Ted has been principal at MHS for past three years. The High school has demonstrated strong progress in all areas during that time. He has a BS Ed. 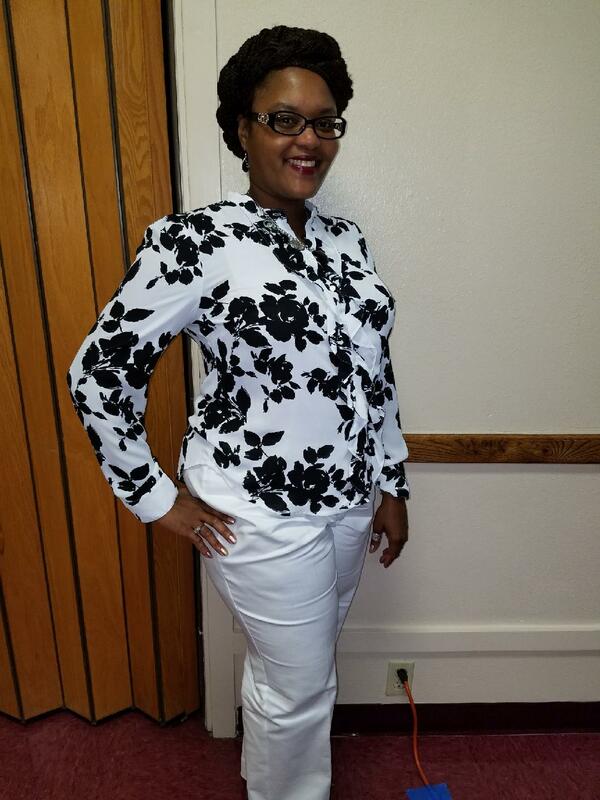 from UT Austin, a Master of Education at PVAMU, and a Mid Management Certificate from SFA. He has been in Education for over 28 years as a teacher, coach and administrator. Ted is a deacon and Sunday School teacher at Central Baptist Church. Principal Certification from SFA, Superintendent Certification from TAMU Commerce. Ted is an active member of Rotary, TASSP and ACSD. His wife Angela is "Fast For Word" Reading Coordinator for MISD. She has served as an officer in the Mavette and Chorale booster clubs Ted and Angela met while students at UT Austin, both graduated in 1983, were married January 7th,1984 and have two daughters, Holly and Heather, both graduates of Marshall High (Wife, Angela is too). Both girls sang in the award winning MHS Chorale. Holly (2007-8) and Heather (2010-11) were Mavette Captains and three year members of the drill team. His oldest daughter, Holly, is a senior math major at UT Austin and will graduate in May 2012. Youngest daughter, Heather, is a freshman communications major at UT Austin. Ted loves to travel and spend time with his Family (Angela and recently took a cruise in Alaska), but he is into golf too, admittedly not well, but who is? He loves being in a blind on a cold winter morning waiting for the first ducks to fly by, or being outdoors stalking an elusive deer, through the woods. In a boat on the lake or the bank of a nearby river or pond, fishing relaxes and invigorates him. Ted can just as easily curl up with a good historical fiction novel, or lose himself in the twists and turns of a really good spy yarn, or take in a Movie. He claims a modest talent in the kitchen and on the grill as well, where he likes to try cooking different things different ways. As you can guess he is into almost all sports Maverick related, but cheers the for the Longhorns, Rangers, Cowboys, and Dallas Mavericks, when the opportunity arises. Ted is a faithful Rotarian, having joined the club in 2008, he has always said “Yes” when asked to do a job or take part in an activity. PDG is a title in Rotary that is reserved for the very few entrusted with the affairs of Rotary each year. These are ordinary Rotarians who, in the course of their Rotary life have caught the eye of their own club and been proposed for the highest office in the district. Only a few of those proposed make it through the interrogation and election process to be chosen. Then these few are subjected to a rigorous training that is to prepare them for this high office and the responsibilites that come with it. Marshall Rotarian, PDG Ben Agnor is the most recent member to serve as District Governor of this district. There have been three others, but none who served more unselfishly than Ben. You who are new to Rotary can learn a lot about being a Rotarian from Ben. You who have benefited from his ubselfish generosity should thank him from the bottom of your heart. Ben seved in the army, but Margaret deserves a medal for supporting him throughout his Rotary career. Thank you Ben & Margaret Agnor. O ne of the more colorful traditions of Rotary is the exchange of club banners. Rotarians traveling to distant locations often take banners to exchange at make-up meetings as a token of friendship. Many clubs use the decorative banners they have received for attractive displays at club meetings and district events. The approximately 20,000 banners in the Rotary History and Archives collection reflect clubs' hometown pride and their connection with the international organization. In addition to incorporating the Rotary emblem, banners often include symbols or imagery of a club's town, region, or country. Others represent local craftsmanship or cultural traditions by displaying leatherwork, weaving, embroidery, or hand-painted designs. If you have plans to travel, make a point of making up at a club in the city or country where you visit. You will have a great time, learn how things are done in other clubs, and meet a bunch of friendas in the process. Ask Jim Fitzgerald or Linda Endicott help you locate a club that meets during the days you will be there, and which is convienent to your travel destination. then, pick up one of our banners and take it along with you and ask to trade banners, and bring their banner back and we will put it on our club banner display. Ben was born and raised in Marshall, Texas. In 1958 he received a Bachelor of Science degree from A&M , in Animal Husbandry. He was 1st Lt., Training Officer, Advanced Infantry Training at 100th Division (TRNG), Ft. Chaffee, AR. He is retired from Eli Lilly & Company in 1987, where he held positions as Director of Sales to Vice President of Marketing. During his career with Monsanto Chemical and Eli Lilly he led delegations of farmers to Europe and South America. As a vice president of the Elanco Ag. Chem. Division, He was responsible for 300 sales representatives, 30 field managers, 28 marketing managers and associates, and over $500,000,000 in annual sales, substantially from Treflan, the world's largest-selling herbicide for approximately 12 years. For 2 years his division was the most profitable of all of Eli Lilly & Co.'s operating divisions. After retiring in 1987, Ben and his wife Margaret moved back to Marshall, Texas. They live in the house his parents built in 1929. They built a small guest house behind it and bought a small lake house on Caddo Lake, where he grew up hunting ducks and fishing, which he still enjoys. They have three children, Mary Kathryn, Annabell Duncan of Georgetown, TX, and Thomas B. Agnor of College Station, TX. They have five grandchildren. They are members of the Cumberland Presbyterian Church of Marshall. Ben's dad, Tom J. Agnor, was a member of The Rotary Club of Marshall, TX. His daughter, Mary Kathryn Kirkpatrick, is a member and Past President of the Rotary Club of Marshall, becoming the third generation of his family to love Rotary as a member of the same club. Ben has served the Rotary Club of Marshall as President, Club Service Director, International Service Director, and Sponsor of Ambassadorial Scholar Lynsey Houchen, as well as many other fundraising projects and duties. He has served on the District GSE committee for several years, was host chairman for the South African GSE team. In Feb.- March 1998, Ben led the GSE Team from District 5830 to Tasmania, Australia. He served as district governor in 2004-2005, during the "Rotary International "Centienial" year, and attended the Chicago Convention in 2005.. The president that year was Glenn E. Estes, Sr., whose theme was "Celebrate Rotary". Ben's District Secretary was a reletively new Marshall Rotarian, Jenifer Larned. Ben and Margaret are Paul Harris Fellows, Members of "The White Hat" Society, and TRF Major Donors. He has attended Rotary International Conventions in the United States, Canada, and many foreign countries.. In 1922 or 1923, the Marshall Rotary C1ub established a student loan fund whereby students could submit letters of application for loans from the Marshall Rotary Club. The applications were reviewed, and on a selective basis, money was loaned to students to further their education. The students, naturally had to repay these loans. Mr. Ike Hockwald was, more or less, administrator of this loan fund and he was the one individual who kept it going. Mr. Allen Wesson Weaver was the first recipient of a Rotary Loan from the Marshall Rotary Club.. He attended the University of Texas.. He was a Chemical Engineer and he became owner of a chemical plant in Florida. This Rotary fund began with approximately $500 and during the period of the Student Loan Fund, this loan fund grew to approximately $6,000 with the help of various people. After the loan program was in operation for a number of years, the student's response to the loan fund began to dwindle. Student applications for the loans were not as many as they had been in the past. The reason being that the students' loan needs were being met in other ways -- through the banks, and through funds available at the colleges. On September 23, 1948, at which time Mr. Charles A. Fry was President of the Marshall Rotary Club, this loan scholarship fund was converted to a grant scholarship which the money was given to the students for them to further their education. One of the primary donors to this fund was Mrs. Frank Davis. She was primarily interested in this Student Scholar­ship Fund because her husband, Mr. Frank Davis, was a big supporter of the student loan program and he had an extra­ordinary interest in keeping this student loan program alive. Mrs. Davis' family was the primary donor to this fund, and it was and has been a success because of the Davis Family. As stated earlier this fund reached an amount of about $6,000 but the fund having been been invested wisely and coupled with contributions over the years from Rotarians, has grown to a point now where the income from the principal covers the scholarships that the Marshall Rotary Club gives away each year. A select committee chooses the recipients of the Rotary Scholarships each year. The applications are carefully reviewed, and recipients are chosen by the committee. It is not any easy job to select so few from so many excellent applicants. As with the Student Loan Fund, the grants have had some notable successes as well; one of the most famous being Bill Moyer. T he Rotary Foundation of RI is a not-for-profit corporation whose mission is to enable Rotarians to advance world understanding, goodwill, and peace through the improvement of health, the support of education, and the alleviation of poverty. Every dollar contributed to the Foundation funds its humanitarian, educational, and cultural programs and program operations. Clubs and districts apply for and receive Foundation grants to carry out many worthy projects worldwide. The Every Rotarian, Every Year initiative, designed to encourage worldwide annual per capita giving of $100 or more, supports vital Foundation programs. These programs promote international understanding by bringing together people from different countries and cultures. Ambassadorial Scholarships , an international program for university-level studies, sends about 500 students each year to serve as ambassadors of goodwill while abroad. Rotary World Peace Fellowships are awarded to individuals for study in master's degree and professional certificate programs at one of the six Rotary Centers for International Studies in peace and conflict resolution. Group Study Exchange is a short-term cultural and vocational exchange program between districts in different countries for non-Rotarian professionals ages 25-40. Humanitarian grants enable Rotarians to increase their support of international service projects that provide water wells, medical care, literacy classes, and other essentials to people in need. Rotarian participation is key to the success of these projects. Matching Grants assist Rotary clubs and districts in carrying out humanitarian projects with clubs and districts in other countries. District Simplified Grants enable districts to support service activities or humanitarian endeavors that benefit local or international communities. Eradicating polio is Rotary’s top priority. The PolioPlus program provides funding for mass immunization campaigns as well as support for social mobilization, surveillance, and laboratories to help carry out the final stages of global polio eradication. Rotarians have raised funds that will amount to more than $1.2 billion in support by the time the world is certified polio-free and have provided hundreds of thousands of volunteer hours. Rotary is a spearheading partner with the World Health Organization, UNICEF, and U.S. Centers for Disease Control and Prevention in this initiative. As a result of their efforts, over two billion children under age five have received the polio vaccine, five million people who might otherwise be paralyzed are walking today, 500,000 new cases of polio are prevented each year, and the number of polio cases has declined by 99 percent worldwide. Rotary International, the world’s first service organization, is made up of over 33,000 clubs in more than 200 countries and geographical areas. Its members form a global network of business, professional and community leaders who volunteer their time and talents to serve their communities and the world. Rotary's motto, Service Above Self, exemplifies the humanitarian spirit of the organization's more than 1.2 million members. Strong fellowship among Rotarians and meaningful community and international service projects characterize Rotary worldwide. Rotary enjoys a rich and sometimes complex tradition and organizational structure, with many programs that can be confusing to new and even not-so-new members. This was a very moving and inspiring program, honoring the fallen men and women who gave their last full measure of devotion so that we can remain free. We had many guests. Jeff Alvis was in charge of the program. We had a speaker from the VA in Shreveport. The patriotic decorations were done by Donna Maisel. It was a wonderful patriotic program. We have a winner!!! The winner is James Godwin of Marshall. Our Dallas Cowboy Game Package winning ticket was sold at our booth at the Fireant Festival. Thanks to Kenneth for furnishing the tent & decorations, Tom for furnishing the table and chairs, and for Keith , Linda, Louraiseal, and David for taking the time out of your own busy day to help staff the booth Saturday and to everyone who sold tickets and manned the booth at Wal Mart as well. Also many thanks to Geraldine for getting the hotel accomodations for the winner, the Baldwins who donated the seats for the raffle, to Tom for making it all available. One of the newest members of the Rotary Club of Marshall and District 5830, is not a new Rotarian at all. As a matter of fact, Dr. Dee Rea was active in Rotary long before most of us even knew about Rotary, because as a very young Periodontist in Longview, he joined the Longview South club, where he, along with two other Rotarians, Dr.Troy Jolly from the Marshall Rotary Club and Dr. David Nichols from the Tyler Rotary club, established a makeshift dental clinic in Belize to treat the indigenous indians in a remote village. There they treated thousands of patients and eventually succeeded in securing a site for a more permanent clinic, equipped it with a Dental Chair and autoclave so that they could do more than extract abscessed teeth. Unknown to Dr. Rea at the time, he was teaching another new member of the Rotary Club of Marshall that real happiness comes from helping others and the idea of service to others is what being a true Rotarian really means. Inspired by this young Periodontist's example he also became a real Rotarian, eventually became president of the Marshall club and then District Governor 1992-93, even traveling to another country in support of a medical mission in Orani, Baatan himself. Now coming full circle, Dr. Rea has been sponsored back into Rotary again, now in the Rotary Club of Marshall, by that same New, but now Old, Marshall Rotarian, PDG Jim Fitzgerald. Welcome visiting Rotarians and guests. Enjoy the food, fellowship, and a great program with us. click here to sign up to receive our newsletters. Aexander, F.A. "Moving Pictures, Theatre" Proprietor, Elk Theatre. 512 N. Washington Ave. Res. 508 N. Boliver St.
Carter, August G. "Wholesale Produce" Partner , Alexander Com. Co. N. Washington Ave. Res. 308 Railroad Ave.
Hon. T.W. Davidson, "Attorneys at Law" Partner, Davidson & Blalock Austin, St. Res. Elm St.
Davis, Frank "Grain Elevator" President, Marshall Mill & Elevator Co. On T.P. R.R Track Res. 501 E.Austin St.
Daniels, Ray "Ready-to-wear Retail" Manager, Perkins's Bros Co. E. Court Sq. & E. Houston Ave. c/o Hotel Marshall. Fry, E.J. "Capitalist," First National Bank Res. 304 W. Austin St.
Hall, Clarence "Gas" Manager, Marshall Gas Co. N. Boliver St. Res. 904 W. Burleson St.
Hirsch, Joe "Retail Dry Goods" Manager, Joe Weisman & Co, 511-517 N. Washington Ave. Res. 307 S.Washington Ave.
Hockwald, I. "R.R.Supplies, Retail" L. Kahn R.R. Supplies North Court Square, Res. 113 W. Grand Ave.
Irvine, L.H. "Retail Drug" Manager, Fry-Hodge Drug Co. North Court Square, Res. 304 W. Austin St.
Keifer, Jno. "Hotel" Proprietor, Hotel Marshall E. Court Square & Houston Ave. Res. Hotel Marshall. Littlejohn, R.P. "Insurance" E. Austin St. Res. 514 W. Burleson St.
Mahone, E.W. "Saddlery & Buggies, Retail" Proprietor , Mahone-Keiley Saddlery Co. W. Court Square Res. W. Houston Ave.
Price, M.M. "Printer" Proprietor, Price's Print Ship N. Boliver St. Res. S. Laffayette St.
Pitts, W.L. "Baskets Mnfr." Secretary, Marshall Manufacturing, Co. M. & E.T. Tracks Res. 106 Adkins St.
Pelz, H. E. "(Retail Jeweler" Manager, Matthewson-Pelz Jewelry Co. N. Court Square Res. E. Austin St.
Pierce, Will "Banker" Cashier, Marshall National Bank E. Austin St. Res. 408 W. Austin, St.
Pierpont, C.W. "Clothing, Retail" President, Pierpont-Schendle Co. E. Court Square. Res. 1107 N. Franklin St.
Rogers, Web "Retail Grocer" W. Austin St. Res. Allen Flats. Sargent, Dr. C.S. "Rector" Episcopal Church. S. Border St. (Clergyman) Res. 401 W. Houston Ave.
Steadman, G.P. "Broker, Grain" E. Houston Ave. Res. 405 W. Grand Ave.
Schulle, Fred "Furniture, Retail" Manager, Swann Furniture Co. N. Washington Ave. Res. 402 W. Burleson St.
Wilson, H.O. "Automobiles" Manager, Wilson-Overland Co. Laffayette & E. Houston Res. 509 E. Houston Ave.
Wilson, E.B. "Whlse. Grocery" Manager, East Texas Wholesale Grocery Co. S. Court Square Res. 308 E. Austin St.
Whaley, P.G. "Retail Hardware" Partner, Logan & Whaley E. Austin ST. Res. 322 N.Washington Ave.